CHICAGO HEIGHTS—(ENEWSPF)—August 31, 2017. 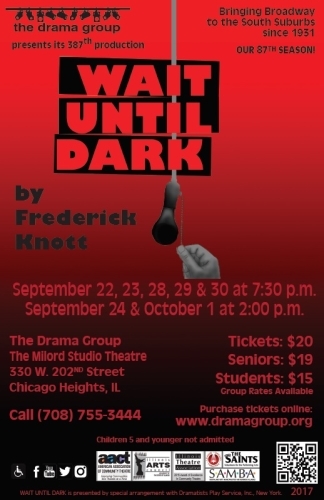 The Drama Group is pleased to present the Broadway thriller ‘Wait Until Dark’ by American playwright Frederick Knott and directed by M.J. Renzi. 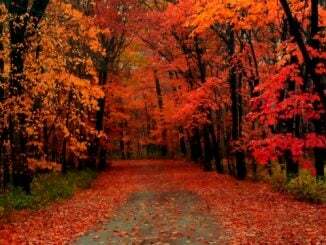 Performances will be held at The Drama Group’s Milord Studio Theatre on September 22, 23, 28, 29 & 30 at 7:30 pm and matinees on September 24 & October 1 at 2:00 pm. A sinister con man, Roat, and two ex-convicts, Mike and Carlino, are about to meet their match. Frederick Knott’s thriller is the story of Susy Hendrix, a recently blinded housewife who unwittingly possesses a doll filled with illicit drugs. Harry Roat, a brutal and sophisticated criminal, coerces two small-time thugs into helping him con Susy into giving up the doll. A battle of wits ensues as Susy and the young girl upstairs launch a counterplot against the thieves. The drama plays on the themes of darkness and light as Susy navigates through her sightless world matching wits against evil. A Broadway hit, this masterfully constructed thriller moves from one moment of suspense to another as it builds toward an electrifying, breath-stopping final scene. “Wait Until Dark’ is a tense thriller.” —NY World-Telegram & Sun.